Your gallbladder is an organ that rests underneath the liver. The gallbladder acts as a storage unit for the liver, storing bile the liver produces. When your gallbladder releases the bile, it moves to the intestines, where the bile then digests fats. If you experience a condition that affects your gallbladder -- such as gallstones or gallbladder disease -- your physician may recommend a low-fat diet to reduce the demands placed on your gallbladder. Lean beef can be a good source of meat in your diet if you choose carefully. Examples of lean cuts of meat include those labeled sirloin, flank and tenderloin. Words like "choice" or "select" can indicate the meat is a leaner cut. Always trim away visible fat from the beef whenever possible. Also, be aware of your portion size when eating. Limit your intake to about 3 oz. of lean meat, which is roughly the equivalent of a deck of cards. Skinless poultry can be a good low-fat choice when you have gallbladder problems. Cut visible fat from turkey or chicken. You can, however, cook the meat with the skin still on it. Take caution when purchasing ground poultry like turkey burgers. Some ground poultry can have just as much fat as ground beef because the manufacturer adds dark meat and skin to enhance its flavor. Whenever possible, purchase ground breast meat or low-fat ground chicken and turkey, which tend to be healthier choices. 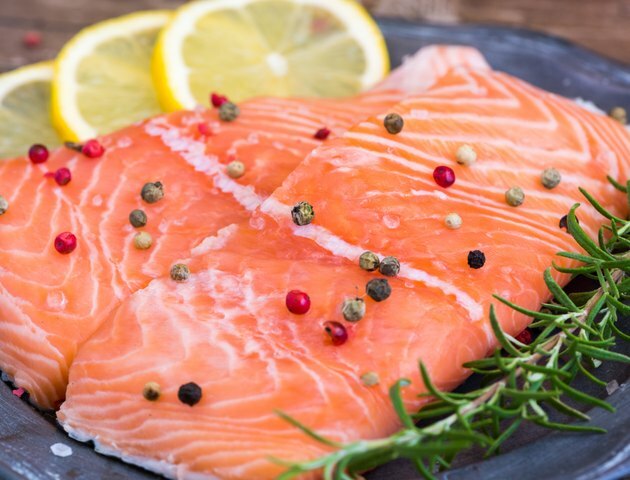 Seafood can be a good source of meats that contain heart-healthy fats. Examples of good choices include crab, lobster, scallops, shrimp, clams, tuna, sardines and salmon. You can eat most fish, but look for those that are canned in water. Bake or broil the fish with lemon juice or fresh herbs to minimize added fat. When you have a gallbladder condition, avoiding high-fat meats is important. If you have too much fat in your diet, your gallbladder may not be able to release enough bile to keep up. The result can be side effects like nausea, vomiting, diarrhea, constipation, heartburn and abdominal pain. Examples of foods to avoid include fried meats, such as fried chicken. Red meats for the most part should be avoided unless they are very lean cuts. Beef labeled "prime" typically signifies it has a higher fat content. Marbled meat cuts also should be avoided because it is difficult to eliminate the fat from these cuts of meat. What Is the Leanest Meat to Eat? Is Seafood Okay to Eat With Gallstones?